Right, the circus is over and there’s still no bread. There are, of course, all manner of reasons to object to hereditary privilege, medieval social arrangements, ostentatious displays of luxury and so on, and liberals aplenty moaned about most of them yesterday. But that bourgeois nonsense doesn’t interest us. We’re all about the economics. The other stuff follows. An elected head of state would be nice. But the installation of an elected head of state would only offer a diversionary sideshow along similar lines to yesterday’s. Things are bad – people are losing their jobs, vital services are having their budgets cut, the state is cracking down on those trying to fight back – so the ruling class needed to bring the smoke and mirrors into action. In the UK this has long been how things are done. Elsewhere they had bourgeois revolutions, giving them the chance to elect heads of state periodically. They get the chance to hit the reset button on the public mood much more regularly. So in Britain they need to do it with way more theatre and pomp. But it all amounts to the same thing. A magic lozenge, as WS Gilbert might have had it, designed to produce the illusion of soothed pain. In the ‘we’re all in this together’ balance, yesterday’s extravaganza is on the other side of the scales to the redundancies, closed Sure Start centres and lost child benefit. The depressing thing is that it has worked. The public loved the circus. But give it a day or two and the pain will return. The lozenge is time-limited. And we’ll be back to what Engels called ‘the dull compulsion of the economic’. Cos that’s what counts. Economics. And capitalism is going to continue to serve up the misery, and its ruling class are going to continue to serve up the diversionary sideshows, until we make the requisite changes. So don’t lose sleep over the circuses. They only exist to mask the unequal distribution of the bread. Sort that out and the rest of the absurd house of cards crumbles. Join the war of position, comrade. Get yourself a copy of our new album, Up the Workers!, learn the words, and then repackage the messages and deliver them to everyone in your home, your workplace, your gym, your local pub, your band, your choir, your rugby club, your internet forum, your corner shop, your drama group, your supporters’ association, your union branch, and anyone else you come across. And give them a copy of the album too. It’s the soundtrack to the war of position. If you want to buy the album in a straightforward way, Soviet Beret will sell you a copy. If you are interested in spreading the word and buying the album in a more interesting way, email us at theefaction85@googlemail.com placing the words “GDH Cole” in the subject box. We will reply with an interesting proposition. Get in touch, comrades. Let’s make the network work in our favour. We see that William Wales, as he has styled himself, and Kate Middleton are getting hitched. If any of you has an ‘in’ at the Palace, can you let them know that Thee Faction are the perfect wedding band, particularly for Royal nuptials? We will tailor our set to suit the occasion, we promise. Every song will scream out exactly how we feel about the ceremony, the scale, and the class the whole thing represents. Of course, just as when his dad married Diana, this is a beautifully timed diversion to encourage us to avert our eyes from the class war their friends in the Tory party will be continuing to perpetrate. We can help with that. We promise not to point that out. We are happy to be complicit in this bourgeois sham. After all, it’ll be our taxes paying for it, and, as we keep being told, there’s not much in the pot. We’re all in this together, comrades. The Royal Wedding will demonstrate that public austerity perfectly, we’re sure. 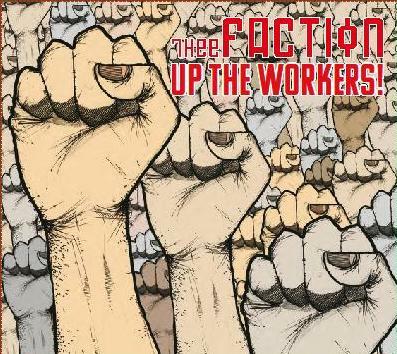 So let’s start the campaign to get Thee Faction playing the reception. Given the constraints on the public purse, we’ll even do it for nothing. We are, after all, all in this together. Wills/Kate – if you need a sample of our Socialist R&B, to convince your folks we’re the right band for the job, you can order one here.